We recently took advantage of the direct flights from Edmonton to Seattle for the long weekend in May. As per usual, we used public transit (the light rail transit and buses were very convenient) and booking on Air BnB to save some coin while traveling on the American dollar (which always leads to more colourful encounters with locals). 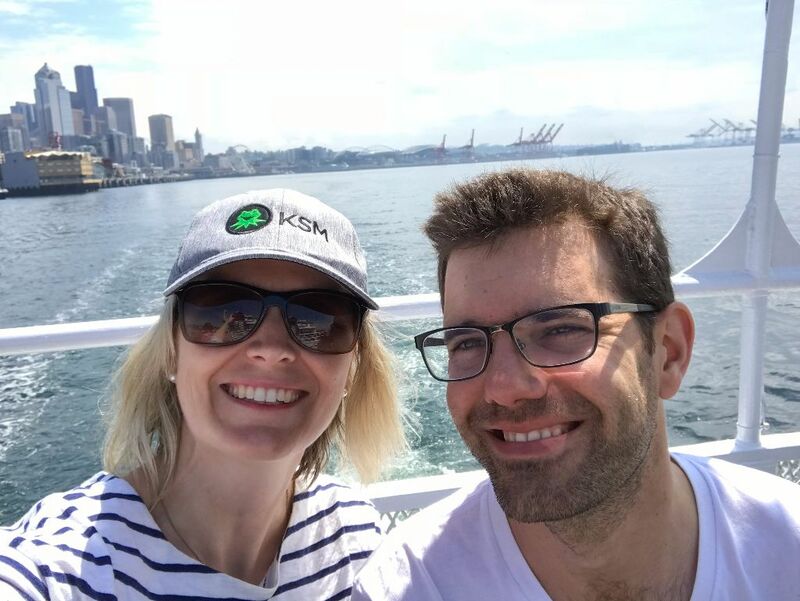 While we have shied from uber touristy activities on our most recent city-break trips to the United States (San Antonio, Portland, and New York City), we decided to go full on tourist with the Seattle City Pass. I knew The Spaniard, a civil engineer, would want to take a ride up the Space Needle, and our friends Marc & Jaddah had suggested the locks harbour cruise tour. With two of those activities (the locks tour was a small upgrade), we decided it would be worth the $89 (American) pass for five of Seattle’s top (insert most touristy) attractions. For our first toursity activity we joined the mob of families taking in the Seattle Aquarium. We had some time before our boat tour so we walked up to the Seattle Public Library, which is definitely worth a visit. In 2007, the building was voted #108 on the American Institute of Architects. The sun came out as were lining up to board our harbour cruise. We booked the upgrade ($15 extra) for the locks Argosy Cruises tour and it was worth the price. On the 2.5 hour trip we got a history lesson on the waterfront, we rose 22 feet in the Ballard locks, we sailed passed boats seen on the Greatest Catch, and even saw the houseboat that Tom Hanks’ character in Sleepless in Seattle lived in. Even though the Space Needle was partially under construction, the view from the top was still impressive. While most people zoomed past the info boards on the way to the elevator, we took the time to read about the building process. Built for the 1962 World Fair, I was amazed to learn that it took less than a year to build and there were no casualties during the construction. A surprise highlight for me was the Chihuly Garden and Glass. The blown-glass exhibit was awe-inspiring. The photos I took do not do it justice – I loved learning about this artist and experiencing the installations throughout the exhibit. Our final piece to the Seattle City Pass was to visit the Museum of Pop Culture. There were some very cool things in the museum and I really enjoyed the Nirvana exhibit, but the place is massive and we did not give ourselves enough time to check out the MoPOP before heading for our flight home. I convinced The Spaniard that we should attend a Seattle Mariners game while we were in town. The stadium is impressive and convenient to get to on public transit. Unfortunately the visiting Detroit Tigers pitcher was on his way to getting a no-hitter (exciting if you are a baseball fan, but not so much if you are from Spain, new to watching baseball, and want to see some action). Near the end of the game the home team finally got a hit. They spent the whole game down 2-0, and in the bottom of the 9th the Mariners tied it up and sent it to extra innings. The hometown team went ahead in the bottom of the 11th and resulted in a very exciting finish to the game. We also had a chance to catch up with Miguel’s friend Kareem. His wife and I got to know each other while the duo, who studied together in Spain and Denmark, reminisced on the time spent working on their masters. The evening involved some hip and tasty spots in Ballard including The Walrus and the Carpenter, Pie Bar, D’Ambrosia Gelato and King’s Hardware. During our trip I also enjoyed our meal at Capitol Cider. which has an extensive cider drink menu, and entirely gluten free menu. But my favourite bites of the weekend were at Sunday brunch in Ballard at Porkchop & Co. Although he really wanted the french toast, The Spaniard graciously ordered gluten-free with me so we could share two dishes. We did the obligatory Pike Place Market visit, but we ripped through it quite quickly. A few too many tourists and the gluten free cinnamon bun I specifically went there for was nothing to write home about. Although, it was entertaining watching people pose in the disgusting gum wall alley while The Spaniard sipped a latte. The weekend was over before we knew it. We definitely need to make it back to Seattle to spend time in Capitol Hill, walk some more neighbourhoods, take in some live music, and check out more of the food scene. Seattle – we will be back!